To create a project navigate to “WP-admin > Portfolio > Add new”. Fig. 1. Project adding/editing interface. Add/Edit Project Media box is 100% identical to “Add/Edit slides” box in slideshows (please refer to this article for details). Images (as well as videos) added here are called “Project Media” and can be displayed as slideshow, gallery, list, etc. 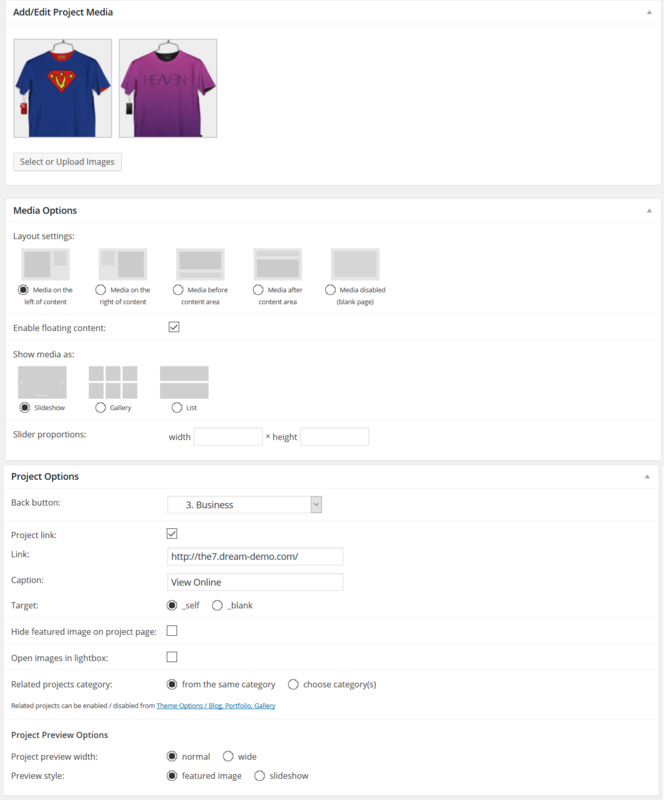 Media Options box allows you to choose the layout (Media on the left of content, Media after content area, Media before content, etc) and appearance of project media (Slideshow, Gallery or List) and choose its interposition with rest of page content. For “Media on the left of content” and “Media after content area” you can “enable floating content”: content on the side of media will float in the same place during the page scroll. Tip for experienced users. You can refuse using Project Media and its Options altogether in favor of using Shortcodes to build any custom layout [of project page] you like. Add external project link, its caption and target (this is useful for web-dev studios). Hide featured image on project page. Decide whether to open larger versions of project media files in the lightbox. Set category(s) for related projects. Choose the project preview width (normal or wide) and style (featured image or slideshow) on the portfolio list page. If “slideshow” style is chosen, you will be prompted to set the “slider proportions”.